Despite the bitchin’ soundtrack, Telltale Games’ latest collaboration, Marvel’s Guardians of the Galaxy, can’t be called a thrilling, rock-fueled space opera. It’s more like easy listening. The first episode’s biggest event happens in the first few minutes, and everything else is characters sitting around and contemplating the aftermath. That’s kind of what works about it. Superhero films are fast. There are exceptions, like Logan, but for the most part they’re a series of set pieces broken up by quieter scenes that mainly serve to set up other set pieces. That makes sense in action films, but it doesn’t leave a lot of time for personal development, and risks over-simplifying (or even eliminating) a character’s story arc from the comics. 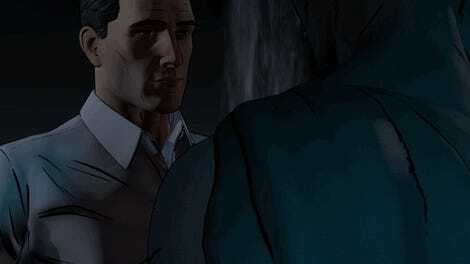 Telltale’s games don’t operate like big-budget action films. They’re more like interactive graphic novels, prioritizing character and story over combat (hence why some people don’t enjoy them, which is understandable). The hardest parts of the company’s games aren’t the battles, which basically amount to “press/click this circle,” but rather those dreaded decisions that change where the story goes and how it affects the characters. Guardians of the Galaxy is no exception. Major spoilers ahead, so be warned. The game requires players to understand the Guardians and their basic dynamic, meaning they should have some history with the films or comics. This isn’t an origin story—the characters have been together for awhile and have already established their “groove.” That does come with its advantages and disadvantages. We’ve already seen their origins in the first Guardians of the Galaxy film, so there’s no need to rehash that again. Plus, it’s nice to see a game that doesn’t treat its audience like newbies. However, it can put characters into boxes when needed for the plot. Gamora suffers the most, becoming the game’s moral compass for the game’s inevitable “either/or” decision, even though it doesn’t totally gel with her character. What’s that big decision, you say? What to do with Thanos’ corpse. That’s right, in the first few minutes of the game, the Guardians kill Thanos. Pretty easily too (Rocket press/clicks him to death with an atom-destroying gun). Barring the fact that this goes against almost everything we understand about Thanos and his history, it also throws out the supposed big bad almost instantly. It feels like what you’d get if Telltale Games had started its Game of Thrones series by destroying the White Walkers. Sure, Westeros has its share of problems, but that one was kind of a big deal. So, where do you go from there? That’s exactly the point. One of the game’s biggest strengths is looking past the Guardians’ “happily ever after” and examining how strong or weak their family truly is. The Guardians have defeated one of the galaxy’s biggest enemies. They’re not pariahs anymore; they’re universal heroes, and can do anything they want. Almost half of the first episode is them chilling in a bar, drinking and figuring out what’s next for the group. So, what’s keeping them together? Turns out, not much. Rocket immediately wants to split off and do his own thing, thinking the group has run its course—a decision Groot disagrees with, but may end up following out of loyalty to his friend. Gamora and Drax are more ambivalent, which means they’re not eager to leave, but not super devoted to the family either. The only one super eager to keep the Guardians together is Star-Lord—that is, until an artifact called the Eternity Forge (which the Kree are after) tempts him with his own nostalgia. They fight in the bar, they fight on the ship. They even fight about what they’re fighting about. Star-Lord can either try and put out the fire or fan the flames, but he’s always going to leave someone mad in the end. Honestly, not much else happens, apart from figuring out who to sell Thanos’ body to, and the Kree scuffle afterward. The game is a slow but steady ship, focusing on the characters instead of who they’re up against. 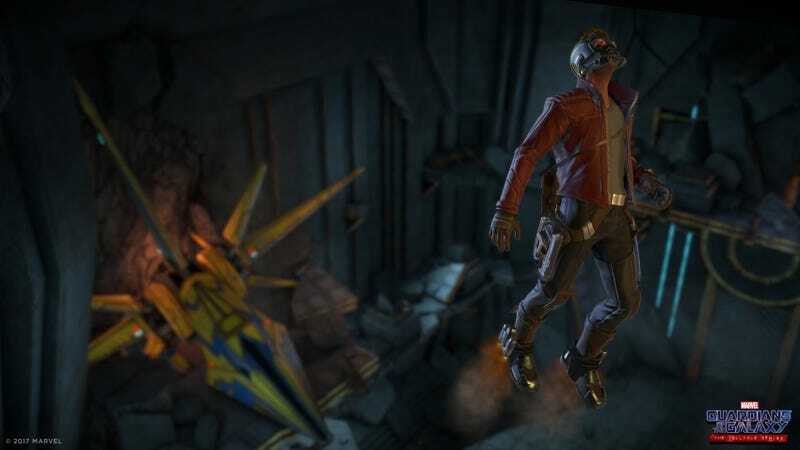 Telltale’s Guardians of the Galaxy isn’t the most action-packed game, but it carries its own unique charm. It’s great to see a visual representation of the Guardians that lets the characters do a bit more emotional steering. One of my biggest problems with the first film is I didn’t feel like I got to know the characters very much. I wanted to know more about them and how they felt about one another. This may very well change with the second film, which looks incredibly promising, but in the meantime this is a solid substitute. Sadly, we’re still lacking Star-Lord’s abs. Hopefully that will change in the future.